Pixar’s latest animated film, Inside Out, which depicts the personified emotions in the head of an 11-year-old girl as she struggles to come to terms with moving with her parents from Minnesota to San Francisco, is perfect for people who don’t normally get the subtle humanity of Pixar films. If you thought Toy Story 3 was a fun but bland tale of toys struggling to survive; if you thought Brave was a boring story about a feisty princess with some half-baked girl power; if you thought Up was about an old man who just wanted to park his house somewhere new – then Inside Out might be the Pixar film you’ve been waiting for. The great strength of Pixar’s films is that they tell powerful stories about gaining emotional maturity, layered with easy-to-digest humour and physical action. They elicit strong feelings in the audience by telling simple and universal stories of personal growth. In particular, they often use melancholy to drive a dramatic arc that plunges before soaring to wonderful heights. 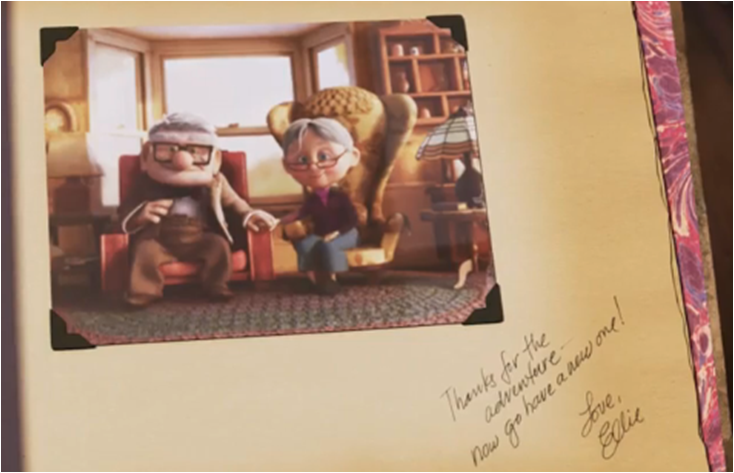 Pixar’s finest moments are typically bittersweet, like when Carl Fredricksen turns the last page in his scrapbook and sees for the first time a final note from his deceased wife encouraging him to move forward: it’s a cathartic experience for Carl and for the audience, who can let go of the pain of past losses and unfulfilled dreams and learn to dream again, even while acknowledging and honouring what came before. 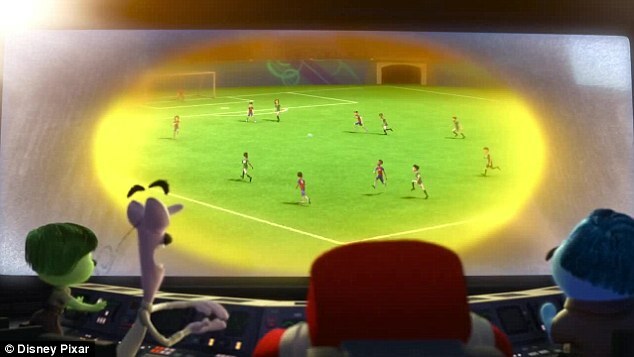 I can only assume that some people just don’t get these scenes and that’s why Pixar went and made Inside Out. Carl finds the last page in his Adventure Book. No words are spoken. No explanation is given. None is required. Inside Out tells the story of an 11-year-old Minnesotan girl named Riley who moves with her family to San Francisco and loses everything she enjoyed about life where she grew up. Riley struggles to deal with the change and the uncertainty it brings. 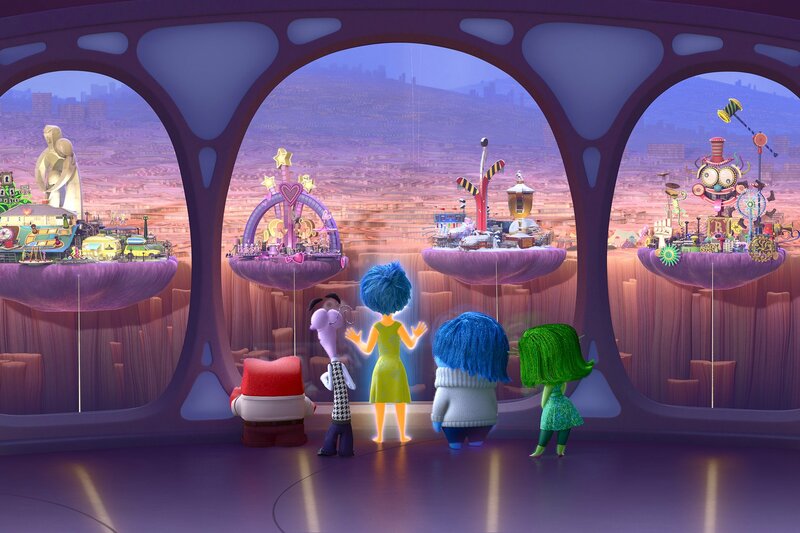 This would be a fine enough story, but Inside Out tells it through a framing device: we see most of the story from inside Riley’s mind, where five emotions (the personifications of Joy, Sadness, Fear, Disgust and Anger) compete to determine Riley’s response to her circumstances. We can see in detail how Riley’s mind struggles with confusion and inner-conflict; how the core of her personality is shaken; how she sinks into depression; and how she recovers and matures by learning to combine and expand her emotional repertoire and become a more sophisticated and nuanced person, as befits someone making the transition from pre-teen childhood to adolescence. To be clear, this is essentially the same stuff that happens to the protagonist of every Pixar film, only with Inside Out the internal change is laid bare for the audience to see. Unfortunately, this robs Inside Out of any opportunity for subtlety or surprise. As Riley’s emotions press buttons and pull levers inside her mind, what normally comes across as human and natural is exposed as mechanistic. We can see the plot twists coming from the moment that important mechanisms inside Riley’s head are alluded to. It’s impossible to have your mind blown when you’ve been blown inside the mind of your protagonist. The film tries to get some laughs from the framing device, by occasionally diving into the minds of other characters; but only the laziest and most obvious stereotypes are employed and provide slim pickings for original jokes. Inside Riley’s dad’s head, he’s thinking about football instead of listening to his family. That’s funny because that’s what all dads do, right? Worse, I couldn’t help but feel that this revealed the unpleasant truth behind the creative process of Pixar’s great successes: that our favourite emotional scenes from past Pixar films were the result of screenwriters and animation directors pressing the right buttons and pulling the right levers to manipulate the audience into floods of tears. It brought a touch of cynicism into a filmography that appears to revel in emotional honesty. Watching Inside Out, then, is the cinematic equivalent of Dorothy peering behind the Wizard’s curtain in the Emerald City. What you had believed to be somehow both magical and real is exposed as a fraud. The magic of cinema is in disguising the craft and allowing the audience to believe in the illusion. When you make a film that explains exactly how those illusions are created, that belief in cinematic magic becomes impossible to sustain. The personality islands inside Riley’s head. Gee, they seem to be hooked up with some real tenuous connections. Do you think something could happen to them? In this way, Inside Out is paired with the perfect pre-feature short film. Pixar’s pre-feature shorts are typically silent affairs without dialogue. They take 10 minutes to tell an emotional story through nothing but images and music. The new short film Lava, which runs before Inside Out, takes a different approach: the story of two sea-born Hawaiian volcanoes struggling to surface next to each other is narrated in song; every emotional beat is spelled out in the simplistic and explicit lyrics, devoid of metaphor. Inside Out represents for me a troubling turn: it comes across as mechanistic and cynical, and its very existence manages to taint past successes from Pixar. It wasn’t for me, but some will undoubtedly like it. If you didn’t spot that the subtle message of Brave was that true courage lies not in physical ability or in the “better than the boys” brand of girl-power but in sacrificing your own desires for your family and community, then Inside Out might just be the perfect Pixar film for you.